Here's the Alan Marx (second from right with son Jared) crew of October 22 with some of their catch of rockfish and sea trout to more than 20 inches. The trout fishing will only get better during the next few weeks. 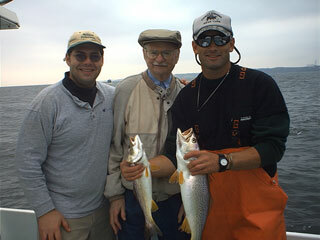 And here's part of the Ira Reiz crew from October 16 with a couple nice sea trout. Trout jigging at this time of year can be fast and furious. 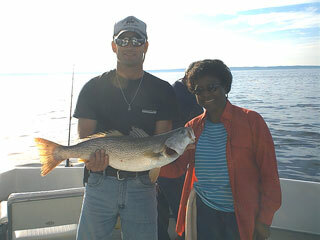 And here's Ms. Hill with a 28 inch whopper sea trout, which she caught jigging in deep water on October 13. What a beautiful fish! It's October and seatrout fishing is warming up. 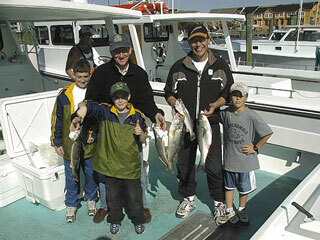 Here's the Mark Heintzelman crew of October 8 with some of their catch of stripers, bluefish and seatrout. From left to right, that's Ann, Gary, Laura, Beverlee, Mark, and Jess. Here's most of the crew of October 7 from the Paralyzed Veterans of America, led by Mark Riston (second row). From left to right, that's Jeff Dolezal, Fred Cowell, Gordon Mansfield, and Rick Glotfelty. 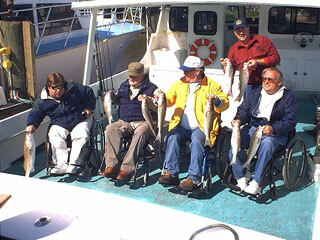 For more photos of the PVA crew, click here. 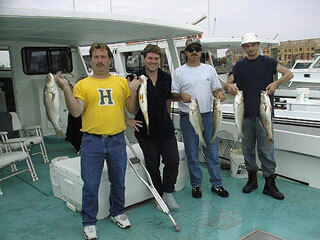 Here we have the Frank Stebbing crew from October 6 with some of their limit catches of rockfish. 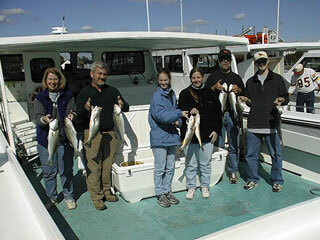 About 50 blues and seatrout were also caught. From left to right, that's Bradley, Billy, Mark, and Frank. 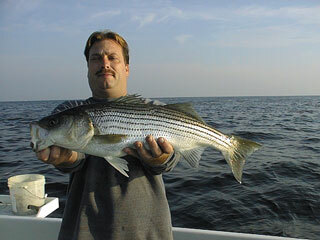 And here's Bradley with a beautiful 24 inch rockfish, largest of the day.